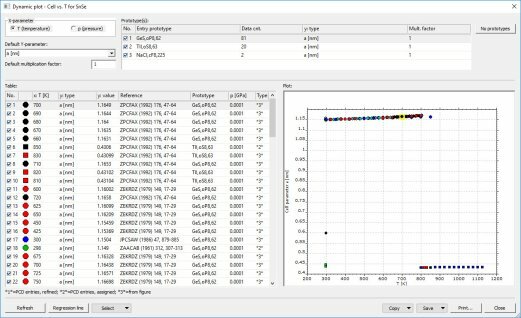 You can create plots of unit cell parameters against temperature or pressure from various sources (entries) with the same composition as the current entry, by clicking on the corresponding links at the bottom of an entry’s data sheet. These plots can be helpful e.g. in order to detect or investigate phase transitions. 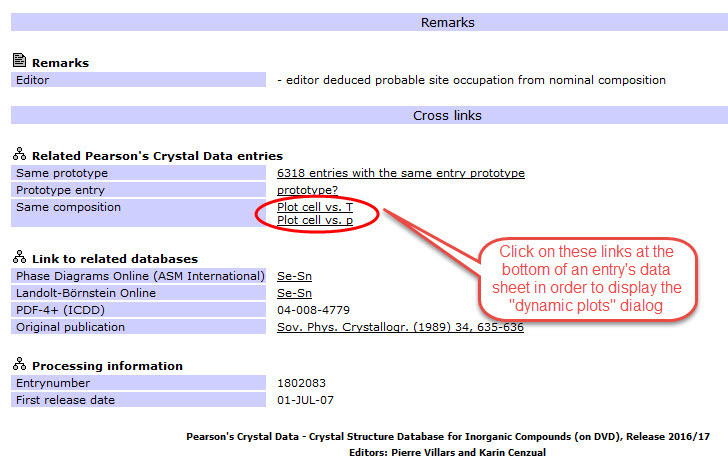 When the user clicks on one of these links, the software internally searches for all entries that share the same composition (in atom %) with the entry for which the data sheet is displayed, and for which plot data are available. Afterwards, the so-called ”Dynamic plot” dialog is displayed. If you take a closer look at the plot on the right-hand side of the table in this example, there seem to be at least four groups of entries in the plot (see figure below), each of them being possibly related to a certain structure or phase. The step at T = 800 K could be a sign for a phase transition of the compound SeSn at this temperature. 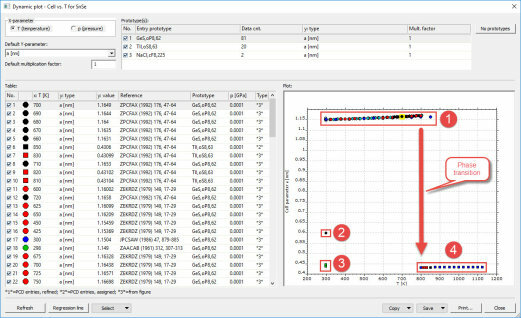 By marking (clicking on) the symbols in the plot, you can mark the corresponding lines in the table to its left (and vice versa). In this table, the various sources (references) of the plot data are given, along with their plot coordinates (values of x- and y-values), the prototype of the corresponding compounds and the source type for the information given. Finally, you can enable or disable the displaying of individual data points by marking or unmarking the checkboxes in the left-most column of the table. 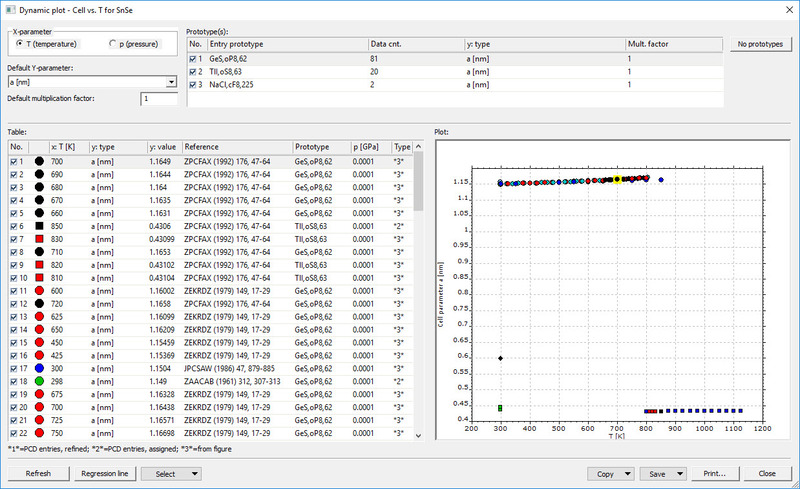 At the top left of the dialog window, you can select which type of information (either temperature or pressure) you would like to display on the x-axis of the plot. Below, you can select which information (e.g. 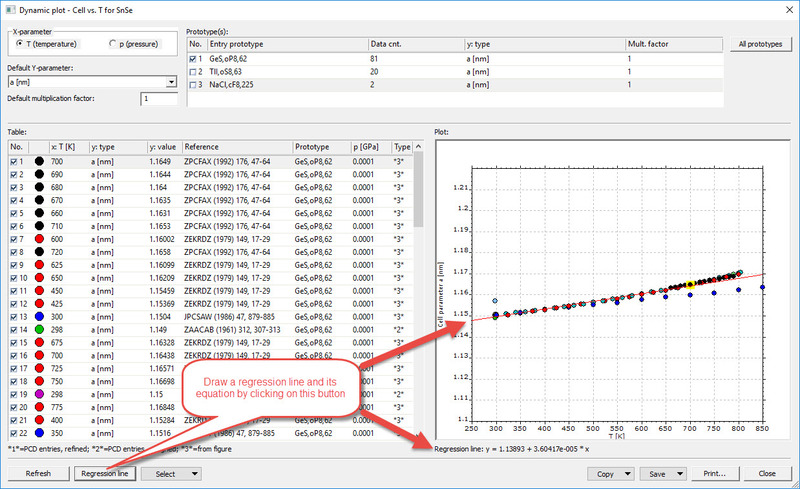 unit cell parameter) you would like to display on the y-axis. In addition, a multiplication factor for all data points (”Default multiplication factor”) is available. 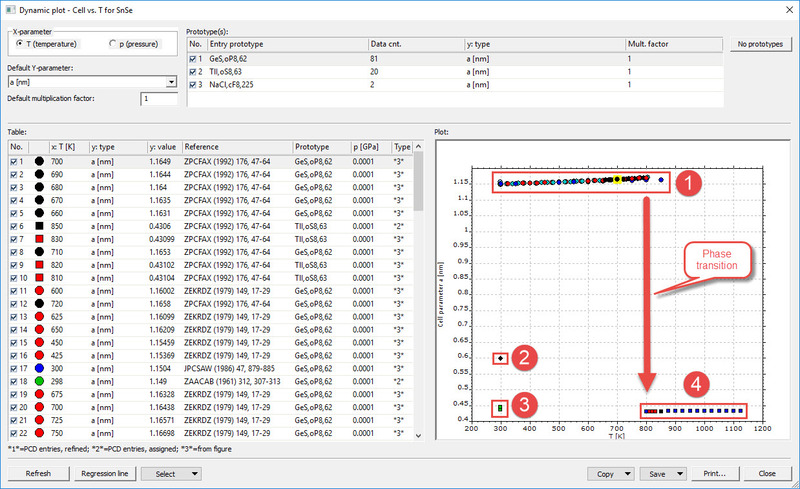 To its right there is a table where you can mark the entry prototype(s) for which you would like to include data in the plot, using the corresponding checkboxes in the column ”No.”. 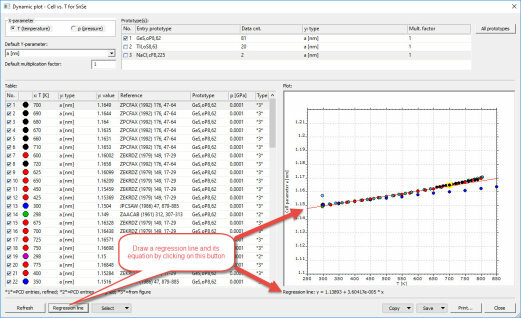 In this table, you can also modify the type of information you would like to display on the y-axis, separately for each entry prototype (line), as well as the corresponding multiplication factor. Furthermore, you can modify the x- or y-parameter values of individual data points, simply by clicking in the corresponding line and column of the main table on the left hand side, and entering the new value. Commands for copying, saving or printing the plot or table are available at the bottom right of the dialog. Page last modified February 18, 2019. Copyright © 1997-2019 Crystal Impact GbR. All rights reserved.